As winter surrounds us, the sky remains dark most of the time, with less than five hours of low, weak sunlight by month’s end. Thank you for keeping our signal of God’s Love beaming bright throughout western Alaska’s 100,000 square miles! May He greatly bless you for your kindness. RADIO STATION OF THE YEAR!!! (below, left): For an incredible 4th year in a row, the top Gabriel Award graces the KNOM studios. The morning general manager Tom Busch returned to Nome from the awards ceremony in Las Vegas, everyone in the KNOM building gathered for a quick photo. From left: music director Kelly Brabec, public affairs director Michael Warren, news reporter Victoria, education director Matt Christy, office assistant Connie Albers and specialty programs director Mike Nurse. 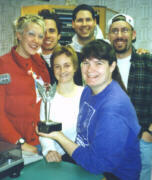 KNOM’s Gabriel was their highest radio honor; the top TV award was presented to WCVB-TV Boston and KYTV-TV, Springfield, MO. In the 34-year history of the Gabriels, KNOM has been given their highest Gabriel tribute an astonishing 7 times. Accepting the award, Tom Busch recognized our mission’s many contributors. “We stand upon their tall shoulders,” he told the audience. For a photo of the assembled KNOM “fan club,” at the ceremony, see below. INSPIRATIONAL SPOT: It seems that we seek out God the most when we are at our weakest, our most vulnerable. These are the times when we most need to place our heart in His hands. To surrender to the trials we face. Accept them. Ask God to focus your heart on Him, instead of asking Him to remove or change the trial. Because it is in the surrender to Him that we find peace. top 25 YEARS AGO: November 1974, KNOM’s emergency generators complained, but they continued to operate, keeping the station on the air during Nome’s worst storm in forty years. Nome’s power plant flooded, and Nome’s post office, jail, stores, restaurants and water distribution system were all swamped by a powerful ocean water storm surge that crashed completely over the town’s seaward buildings, repeatedly pounding onto Front Street and slamming into structures across the street. dish along the Bering Sea shore. The satellite installation flooded, cutting off all communication -- except for one circuit. That was the Associated Press teletype, which had not yet been switched. Using the keyboard of the old fashioned Associated Press teletype, KNOM volunteer news director Steve Havilland hand typed emergency messages, and, together with one amateur radio operator, maintained Nome’s only links with the outside world. KNOM remained on the air for 42 continuous hours of emergency information, companionship and comfort. The 1974 flood destroyed Nome’s city hall and fire station, and three dozen homes on the east side of town. Front Street businesses suffered two million dollars of flood damage. At about 25 feet above sea level, both the KNOM studio and transmitter stood dry, 13 feet above the storm surge. Whew! top FIRST DAZE (left): For a new volunteer like Victoria, there is so much to learn. A newcomer, however, soon discovers that everyone on the staff is willing to take time to help out, like fellow volunteer Mike Nurse. In the photo, Mike lends a hand as Victoria picks up experience using the gear in Studio C.
KNOM is the oldest Catholic radio station in the United States, a beacon of inspiration, information and companionship throughout vast, roadless western Alaska - thanks to you. 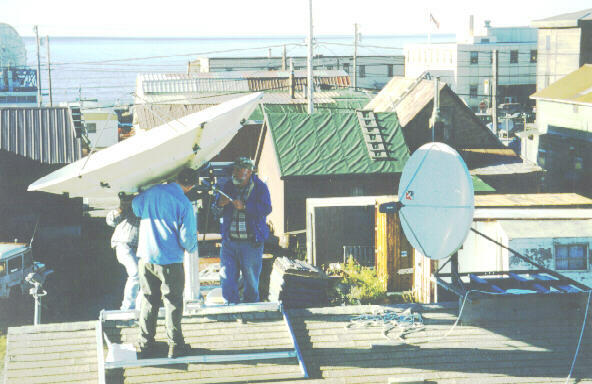 BALANCING ACT: In early September, Les Brown (facing the camera) and Associated Press technicians Doug Remmem and Dave Herron mount a satellite dish on the roof of KNOM’s old cold storage building. Nome is so far north and west that nobody was certain that the Ku (kay-yoo) Band satellite signal would work here. So far, it’s surprised everyone, performing just fine, bringing us AP’s news wire and hourly radio newscasts. At right is a smaller dish which AP installed for a test in August. In the background, you can see the Bering Sea, two months ahead of freezing solid for the winter. INSPIRATIONAL SPOT: Life is made for living, and giving and sharing, knowing and showing, and daring and caring. Along with its ups, in spite of its downs, life’s made of losses, and crosses and crowns. HAVE WE SPELLED YOUR NAME CORRECTLY? We do our very best to keep our records accurate, but like everyone, we occasionally make mistakes. If we do, please correct us. Thank you! BIG DOINGS: October saw 5,000 Alaska Natives in Anchorage for the state’s largest Native gathering. Most villagers can’t afford to attend this important gathering, and KNOM gave everyone front-row seats, thanks to you, with over 27 hours of live coverage. INSPIRATIONAL SPOT: Loving God, Creator of all, bless our children with Your love and goodness. Grant them steady growth in wisdom, knowledge, grace and virtue. Protect them with Your guiding hand and with Your love. Encourage them each day to do their best. Strengthen them in time of difficulty. Make them mindful of the needs of others, of showing care toward elders, of being generous. May our children always follow You. Amen. top WHERE THERE’S A WILL, there can also be a charitable gift that will make a tremendous positive change in many people’s lives for many years. All bequests to KNOM are deposited in funds that provide for emergencies and for long-term improvements to our mission. PEANUT GALLERY (left): After the Gabriel Awards ceremony in Las Vegas, KNOM’ers Tom Busch, Fr. 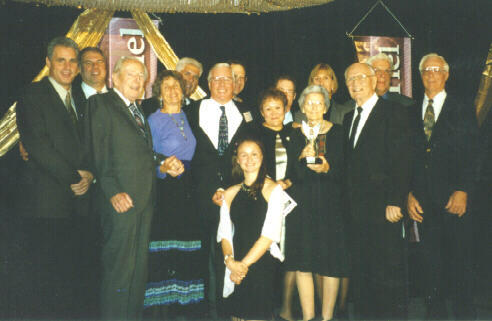 Mark Hoelsken, SJ, Ric Schmidt and Florence Busch, and family and supporters posed on the Monte Carlo stage for a quick photograph. Although KNOM has received 7 Gabriel “Radio Station of the Year” Awards, the tribute is most often given to large commercial stations. We’re in heady company! Fellow past winners include big city broadcasters WNBC New York, KMOX St. Louis, KNX Los Angeles, KDKA Pittsburgh, WCLV Cleveland, WRFM New York and KGO San Francisco. A REAL OPERATOR: Congratulations to KNOM volunteer Mike Nurse, who passed both written and Morse Code exams to become a licensed amateur radio operator with the call sign KLØUJ. Other “hams” on the staff are Les Brown, KLØOG, Florence Busch, KLØQC, and Tom Busch, NL7H. 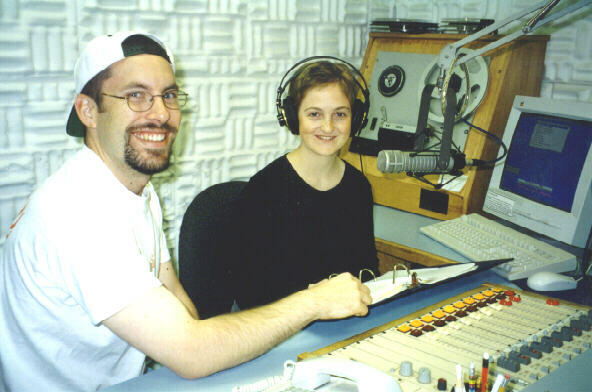 top So far during 1999, KNOM has broadcast 27,500 inspirational spots, and an equal number of educational ones. We’ve aired approximately 630 hours of news, 260 hours of public affairs programs, 90 broadcasts of the Mass, daily Rosary, and many, many other positive and enriching programs. Individual contributions are our only major source of income. We are on the air 24 hours a day, every day, thanks to you. www.knom.org is OUR MISSION’S WEB SITE, with “Nome Static” photos in color, and lots of other pictures and information. Look us up! FISHY: As you’ve read, salmon fishing in the KNOM listening area was disastrous this past summer, an ironic contrast to the record-breaking fisheries in some other parts of the state. In mid-October, Alaska Fish and Game Commissioner Frank Rue and the state’s Commercial Fisheries Director Doug Mecum appeared in a special interview with KNOM news director Paul Korchin to discuss upcoming research into the mysterious disappearance of the fish, and ways in which the fisheries might be brought back to normal some time in the future. HOW LOW CAN YOU GO? It’s been fifty-one years since Nome has seen temperatures as low as -39 in the month of November, although the mercury can easily slip down into the minus teens this time of year. In Nome, November is usually fairly warm by Alaska standards. The average first day of below-zero weather is December 5th. As Thanksgiving approaches, we keep you and your intentions in our Masses and prayers. Thank you for your continuing support for our little mission station. God bless you! INSPIRATIONAL SPOT: Lord, it’s been a while since I felt the Joy of Your Love. It’s been so long since I’ve felt spiritually inspired. Help me to know what I need to surrender to You, so that I may begin a revolution in my soul. Lord, please revive me!